Let Rocky know how handsome he is by leaving a comment on the Facebook post for his Chihuahua Rescue Victoria Success Story! Here is what we said about this Rocky when we first put him up for adoption. 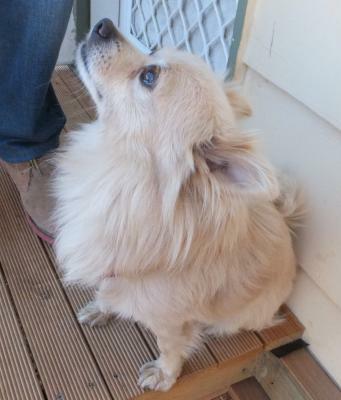 Rocky is a gorgeous little Pomeranian cross. He is toilet trained and just loves his walks twice a day. He also loves raw beef or lamb bones! He has been desexed, microchipped, immunised, given flea and worm treatments. Take me for a walk?? Rocky escaped from his home during a big storm! Luckily he was found the next day, but anyone who has experienced this can remember how disbelief slowly gives way to shock when you keep checking the same places over and over and cannot find your companion. Waiting overnight is even more terrible. Rocky has escaped from his home in Elwood area in the storm late this afternoon. Please watch out for him. If seen please ring. He may be scared. This is the Facebook post about Rocky settling in. It is these communications that make us so happy - to see a rescued dog adjusting to a new forever home. Rocky has really started to settle in to his new home. Here he is on a dog walk to Port Ormond this morning. Today we recieved an amazing photo and update: Rocky celebrates being four years old! Here is my mince birthday cake. I have the two humans pretty much under control! Rocky's 4th birthday and 1st with us! Thank you so much for this update Rocky's new Mummy.